After Completing Intermediate (FSc / A levels / Equivalent) Degree from an Educational Institute most of the Male and Female Candidates wants to Opt for Pakistan Army. 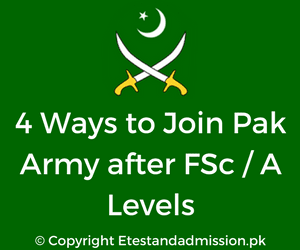 There are Four Ways to Join Pakistan Army after FSc / A levels or Equivalent. Candidates can either Join Pakistan Army through Long Course, Technical Course, Medical Course or as through AFNS. Pakistan Military Academy's Long Course is considered as one of the toughest courses in Pakistan Army. Candidates who have done Intermediate can apply for PMA Long Course. Only Male Candidates are Eligible to Apply for PMA Long Course. After Selection and Recommendation by ISSB and Combined Medical Board, Cadets will have to undergo two years of very hard Military Training at Pakistan Military Academy (PMA), Kakul. After the completion of the course, Cadets will be awarded the Rank of 2nd Lieutenant which is the lowest Rank of an Army Officer. During the training at PMA Kakul, Cadets will also be granted by a stipend of RS. 30,000 - 35,000/- per month and it will remain same throughout the 2nd Lieutenant Rank. Detailed Procedure will be added soon. Technical Cadet Course is for those candidates who want to Join Corps of Engineering in Pakistan Army. Only Male Candidates are Eligible to apply for Technical Cadet Course. Both Pre-Engineering and Computer Sci Candidates (Min 60% marks) can apply for TCC. Selected Cadets will complete their BS Engineering Degree from NUST. After the completion of their Degree, Cadets will undergo one-year Basic Military Training from PMA Kakul. Cadets will be granted by a stipend of RS. 30,000 - 35,000/- per month during their study and training period. On successful completion of the course and training, Cadets will be awarded the Rank of Captain. The monthly stipend will increase to RS. 45,000 - 55,000/- once they have completed their training. Medical Cadet Course is for those candidates who wants to opt for MBBS and BDS Programs. Candidates can either join Army Medical College, CMH Lahore Medical College, Karachi Institute of Medical Sciences, CMH Bahawalpur, CIMS Multan or Quetta Institute of Medical Sciences. For Medical Cadet Course, Male Candidates should have minimum 70% marks in Pre-Medical. During the course, Cadets will be granted by a stipend of RS. 30,000 - 35,000/- per month. Cadets after completing their Final Prof will undergo six months Basic Military Training at PMA Kakul. After the completion of the course and training, Cadets will be awarded the Rank of Captain, and its monthly stipend will also increase as mentioned above in TCC Course. Armed Forces Nursing Service (AFNS) is the only course after Intermediate for Female Candidates. However, Female Candidates can Join Pakistan Army after Graduation in Medical Corps (As a Doctor) and Corps of Engineering (As an Engineer or IT Spelt). For BS Nursing, Candidates should have minimum 60% marks in Matric and minimum 55% marks in Intermediate (Pre-Medical). After completion of BS Nursing and four weeks training from AFPGMI, Rawalpindi Female Cadets will be awarded the Rank of Lieutenant. During the Course and training period, Cadets will also be granted by a monthly stipend. Note: Registrations of PMA Long Course opens twice a year while for other courses it opens once a year.